The first member of the X-Men. Cyclops is outfitted in an aramid-fiber X-Suit with a utility belt. Features light-up effects in his signature ruby-quartz visor! Includes multiple heads, hands, and accessories. 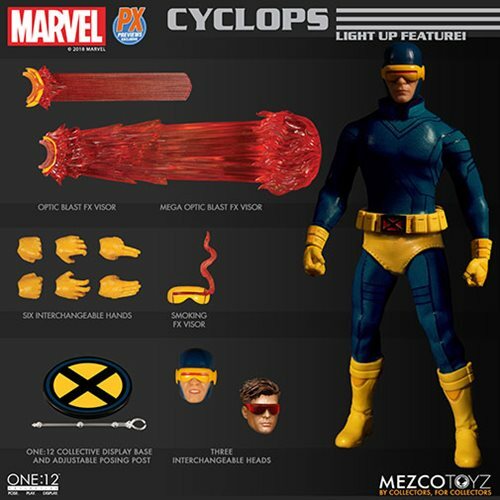 The X-Men Cyclops Classic Version One:12 Collective Action Figure - Previews Exclusive features a light-up optic power function that illuminates his signature ruby-quartz visor that contains the uncontrollable energy blasts from his eyes. The born leader and gifted hero is outfitted in an aramid-fiber X-Suit with a utility belt inspired by his classic costume. Cyclops comes with a range of visor effects that light up when affixed to either head portrait, reflecting his devastating mutant abilities!